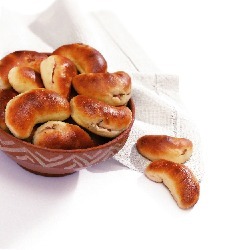 breads & pastries - .andrushka.©. Note: This recipe is intended for baking bread in a traditional wood-fired bread oven. However, you can also bake the bread in an electric or gas oven using a baking tray. 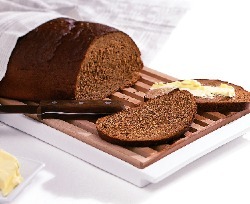 To bake approximately 10 loaves of bread: 10kg coarse rye flour, ~ 5-7 l water, pinch of salt, caraway seeds to taste. For the starter: 250g coarse rye flour, 250g buttermilk, 50g sugar. Note: The amount of ingredients can be reduced as long as the parts ratio is maintained. Before baking, sift flour and leave at room temperature. When baking bread for the first time, you must make the starter. Add sifted flour to buttermilk (both must be room temperature), stir in 50g sugar, cover and allow to ferment in a warm place for 8-12 hours. Then add 500-700g flour to near boiling water and beat thoroughly to form a porridge of medium thickness (to make the mixture thicker, you can gradually add more flour). Add the starter, beat, cover and leave to ferment in a warm place for 8-9 hours or until the mixture sours. When the starter is ready, make the leaven. Mix one third of flour intended for baking with hot water and beat with a wooden spatula until the mixture is smooth. Cool to 35-40°C, then add starter and continue to beat until the mixture is smooth again. Sprinkle over thick layer of flour, cover and put in a warm place to rise for 10-12 hours. When the leaven has a pleasant sour taste and has increased in volume, begin to knead, slowly adding all of the flour, until it has all been kneaded in and the dough is elastic and does not stick to your fingers or the container. The dough must be firm, because as it rises it will become softer. Smooth dough, cover and put in a warm place to rise, until it has increased in volume by one third or half of its original volume. Let it rise for 1-1.5 hours, the time will depend on the sourness of the dough and the season. After baking the bread the abrkasis (a small piece of left over dough which is made hard by kneading in extra flour) is left for a week in a cool place. Next time this will become the starter. To assist its fermentation, dissolve in warm water before use. The oven is lit when the dough begins to rise. To check if the oven is too hot, throw in a handful of flour. If the flour immediately burns to a black colour, then the oven must be cooled. The oven is the right temperature for baking when the flour becomes brown in 5-6 seconds. Each loaf is made to have a weight of 2-4 kg. Sprinkle flour on the bread-shovel, then with wet hands take enough dough for one loaf, place on the bread-shovel and form it into a loaf shape. Smooth the top with wet hands, and score 2-3 lines into the sides, so that the loaf does not crack. There must be no less than a palm width space between each loaf when baking. Bake bread for 1-2 hours, the length of time is determined by the size of the loaves. You can tell if the loaf is ready by listening to the sound when knocking on the underside of the loaf. After removing loaves from the oven, wet the tops with water, cover with a linen cloth and allow to cool. 400-500g coarse rye or wheat flour, 200g water, 50g lard or margarine, 10g sugar, salt, 1 egg. Potato filling: 250g potato, 25g milk, 15g butter, salt. Carrot filling: 350-400g carrot, 50g sugar, salt, 25g sour cream, 2 eggs, 15g flour. Sift flour onto a pastry board, rub through lard or margarine. Heat water to 20-25°C (68-77°F), add sugar and salt (10-15 g) of yeast can also be added), and knead into a stiff dough that can be easily rolled. Roll dough into a sheet of 2-3mm thickness, cut out round shapes 10-15 cm (4-4.8 inches) in diameter. Fold up edges of each round to a height of 1-1.5 cm (0.4-0.6 inches), and place on a greased baking tray. Fill each case with potato filling and then carrot filling. Brush with beaten egg and bake in a moderate oven for 10-15 minutes, until the top has browned and pastry is dry and crusty. Potato filling: Boil peeled potatoes in salted water, drain, mash through a sieve. Add boiled milk and butter and mix well. Carrot filling: Boil unpeeled carrots, then peel, mash through a sieve. Add salt, sugar, sour cream and flour and mix well. 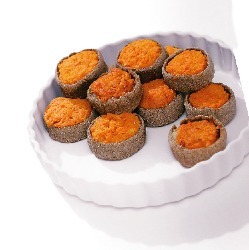 Sklandu rauši can be baked with only the potato or only the carrot filling. Alternatively, add grated fresh carrot, salt, sugar, eggs, sour cream and flour to mashed potato and mix well. 450-500g flour, 250g milk or water, 25 g yeast, 75g margarine, 25g sugar, 5g salt, 1 egg. Filling: 350 g smoked streaky bacon, 50 g onion, ground pepper. Prepare dough without a starter (see above). After dough has risen, divide into 30-35g pieces, roll into round balls and leave on a pastry board for 10-15 minutes to rise. Press each piece flat, place bacon filling in the centre, press together edges of dough above or at the side of filling. Roll with both hands to even out filling; make the shape long with slender ends and bent into a half-moon. Place on a greased baking tray, leave to rise, brush with beaten egg and bake in a hot oven. Brush with melted butter once removed from the oven. Bacon filling: Cut rind off bacon. Dice bacon and onion and stew (stew only for a short period, so that fat does not run off), add pepper and mix well. Dough: 450-500g flour, 250g milk, 25g yeast, 100g butter or margarine, 100g sugar, 2 eggs, 5g salt, cardamom. 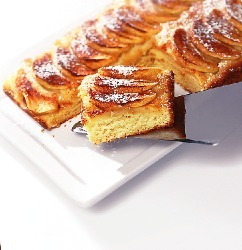 Topping: 800g apples, 50g sugar, 2g ground cinnamon, 50g butter, icing sugar. Prepare dough without a starter (see above). Roll risen dough into a sheet 1 - 1.5cm (0.4 - 0.6 inches) thick. Place on a greased baking tray, smooth and allow to rise. Peel apples and slice. Arrange slices in neat rows on dough. Brush with melted butter. Mix cinnamon and sugar and sprinkle over apples. Bake in a moderate oven until crust has browned and apples are soft. When cool, sprinkle over icing sugar and slice into square or rectangular pieces. Dried apples may be substituted for fresh apples, in this case the apples must be soaked before use. The dough may also be spread with a thin layer of sour cream and sugar before adding apples.